There are many ways to protect connections on electrical assemblies, but few are as strong and as cost-effective as low-pressure overmolding. The process involves melting plastic beads and injecting them into a mold encasing the electrical connection. In many cases, overmolding is used to protect printed circuit boards (PCBs), though it can also be used in place of heat shrink, backshell connectors and potting. The overmolding process creates a material bond around PCBs, wires/cables and connectors, which provides a watertight seal to protect electrical components from dirt, dust and debris. An overmolded electrical assembly can achieve IP67, IP68 and IP69K standards. If the electrical assembly requires frequent plugging and unplugging or if it will be used in applications in which the cable is moved around frequently, electrical connections can become strained. An overmolded connection is much more durable than more traditional protections such as heat shrink, potting and backshell connectors. Depending on the materials used, the overmolding can be somewhat flexible as well, which further reduces strain by spreading the stress out over a longer distance rather than focusing it all at one specific point. Shock and vibration can cause mechanical failure if electrical components are not properly protected. In environments prone to high shock or high vibration, it’s critical to prevent components from moving around within the assembly to ensure the connection remains solid. Since the overmolding process fills in any spaces around internal components, there are no air gaps that would allow components to shift; this makes overmolding the best option to prevent fatigue and other damage. Creating a mold for an electrical assembly can be as simple as machining a piece of aluminum to match the shape necessary to protect an electrical connection or PCB. A mold consists of a top and a bottom piece that come together around the components that will be overmolded. Once a mold is created, it can be stored and reused. Since overmolding creates a strong, weathertight seal around electrical components, you can build a superior electrical assembly using lower-cost parts. For example, unsealed connectors are less expensive than sealed connectors. 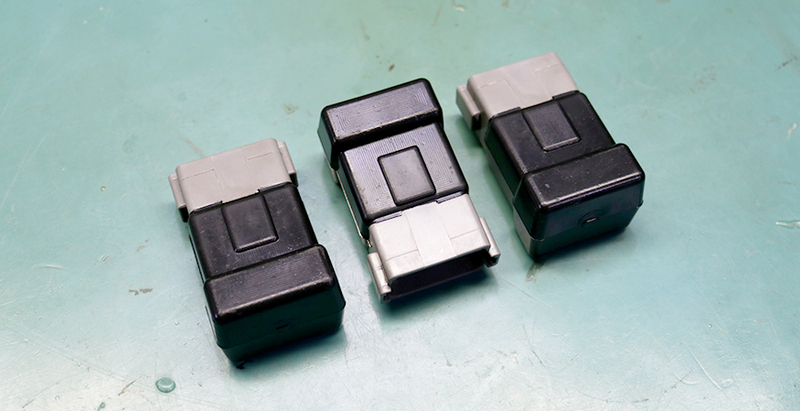 If you know from the design phase that you’ll be using overmolding to protect electrical connections, you can use unsealed connectors in your design. In most cases, the seal from the overmolding will be more robust than that of a sealed connector; the same is true for terminals and PCBs. If you don’t have to worry about how they’ll hold up in the environment they’ll be used in, you don’t have to use the most durable materials. With an overmolding machine like a Mold Man, the process becomes simple: you build the mold and let the machine do the work. Within 30 seconds, the machine can overmold two connections – much faster than alternative connection protection methods can be applied. This reduces labor costs and increases throughput. For any low- to high-volume electrical assembly, overmolding is a very cost-effective way to protect electrical connections. If you don’t have an overmolding machine in-house or a way to make the molds, you can partner with a supplier like MCL that is equipped with the right technology. Think you’ve got an electrical assembly that could benefit from being overmolded? Sign up for a free design review by MCL’s engineering team! Click the button below to get started today.